How Can I Go A1 Pet Emporium? Where is A1 Pet Emporium in The Village on the Map? Such a wonderful pet shopping experience. They have stolen Mr from petsmart! 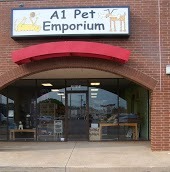 Much better prices and very friendly atmosphere, plus they have a way better knowledge of pet food then the leading chain of pet stores! I brought my long haired chihuahua in that was rescued the night before. I had a concern that I en formed them of, his lack of eating and they directed me to some yummy looking food for him. As soon as we got home he ate it all up! No fuss! I'm really excited because he has a food he likes and I have a new pet store to go to that knows there stuff. Thanks A-1! The staff was super friendly and very helpful and knowledgeable. While they don't have a very large store, the products they do carry are high quality and perfect for the pet owner who cares about taking good care of their pets. I'd recommend this place any day! Very helpful staff and excellent service. BEST place to get pet food. They have the widest selection of healthy food for pets i have ever seen. Locally owned, excellent customer service, and reasonable prices. I won't go anywhere else ever again to get my doggie food.